The construction of this fort took a long time. In the1580s it is reported that Nicolas Melo, OSA built a fortification described as baluarte-castillo de defensa. Work continued under his successor Fray Alonso Calosa, parish priest from 1590-1602. 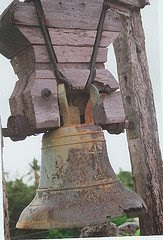 Unable to provide manpower, Cagayancillo was placed under the secular clergy from 1602 to 1626. 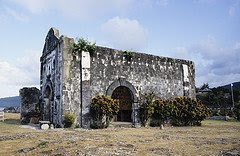 It was returned to the Augustinians who administered the place by annexing it as a visita first to Antique, Bugason, Dao and finally Ani-niy in Panay Island. 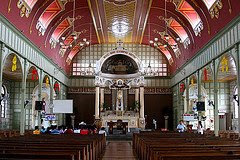 As visita, this meant that Cagayancillo did not have a resident priest; rather a priest from the mother parish would visit it on a regular basis. What a trip it was! 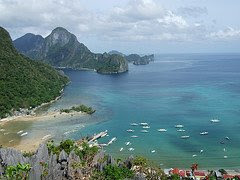 It took all of four days to reach Cagayancillo from Ani-niy on board a sailing vessel like the paraw or the batel, a cargo ship that once linked Palawan with the Visayas. Why did it take almost 130 years to finish the fort? First answer: the island was not under the Augustinians for a long unbroken time during the 17th century. When it reverted to them, it took more than fifty years to finally have a resident priest, apparently Fray Casiano. A friar’s continuous physical presence was needed if an ambitious building project was to prosper. Second answer: morphologically, Cagayancillo’s present fort is a bastioned fort type, which does not fit Galende’s description of baluarte-castillo. 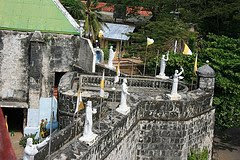 Baluarte refers a detached, free-standing tower but Cagayancillo’s fort is also called castillo, which may mean either that it was of larger proportion that the usual, or may have had an additional wall to it, much like the San Diego de Alcala fortification at Gumaca, Quezon. Or probably, there was more than one fort; Fray Melo’s 16th-century structure being rudimentary tower, whose stones were then incorporated into the present fort. Third reason: there were very few people in Cagayancillo, if the population was placed as 180 in the early 18th century, that means there was little manpower to work on the fort, as it was customary for males alone to work on public construction, women and children were exempt. That cut available manpower by at least half. But then again the slaving raids may have reduced population. But which raids? There were many eras in the history of slave-raiding in the Philippines. There were the 16th century raids, provoked in part by Spanish attempt to cut off the influence of Brunei on trade in the Sulu-Borneo area. There were the 17th century raids during the ascendancy of the Cotabato sultanates and the raids of the second half of the 18th century, catalyzed by the rise of the Sulu Sultanate and the expansion of British trading interest in the Sulu zone. Cagayancillo’s fortification falls neatly into the first two periods of slave-raiding.